Introduction. Feed Intake. Activity of Rumen Microbes. Monensin and Other Antibiotics Fed to Ruminants. Nutritional Energetics. Amino Acids. Nonprotein Nitrogen Utilization. Energy and Nitrogen Utilization in Feedstuffs. Protein and Energy in Forages and Roughages. Effects of Processing Feedstuffs on Nitrogen and Energy. Production Practices Affecting Nitrogen and Energy Nutrition. Nitrogen and Energy in Animal Excreta. Minerals and Water in Nitrogen and Energy Nutrition. Body Composition versus Nutritional and Other Factors. Endocrines and Nitrogen and Energy Nutrition. Effects of Ambient Temperature on Utilization of Nutrients. Composition of Feeds for Ruminants. Glossary. Bibliography. Index. 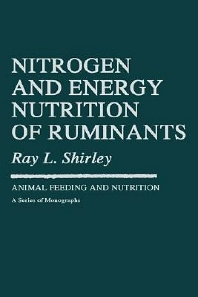 This comprehensive volume examines the interrelationships of nitrogen and energy nutrition of ruminants. It provides exhaustive coverage of basic concepts, applications, and new research developments. Rumen microbial activity is emphasized. The author, an expert in animal nutrition, discusses new systems of determining dietary energy requirements, the effect of processing feedstuffs, and stress factors. He reviews the availability of nutrients in grains, distillers' grain residues, oilseed meals, molasses, silages, pastures, crop residues, and aquatic plants. Growth stimulants, nutritional management of ruminants in feedlots and pastures, and the value of feed additives are also among the topics considered. The scope of coverage provided by this volume will make it the leading reference for teachers, researchers, consultants, livestock producers, feed manufacturers, and all others who are involved in ruminant feeding and nutrition. From the Preface: This volume covers research on various nitrogen and energy feedstuffs and defines terminology commonly utilized in nitrogen and energy nutrition. The utilization of nitrogen and energy in oilseed meals, fish meals, cereal grains, distillers' residues, molasses, silages, grasses, hays, crop residues, animal waste, and nonprotein nitrogen sources is discussed. Details are given on development and utilization of net energy systems, systems for balancing total nitrogen, and nonprotein nitrogen with total digestible nutrients (TDN) or energy components of ruminant diets. Discussions are presented on metabolism, feedlot, milking, and grazing trials. Growth stimulants, processing of feedstuffs, type of animal, and environmental and management factors that affect feed intake, growth, feed efficiency, and quality of product are reviewed. Emphasis is given to the contributions of ruminal microbes in upgrading forage and nonprotein nitrogen sources to higher-quality bacterial protein, as well as their ability to downgrade high-quality protein and waste nitrogen when protein is fed in excess of microbial needs. Research is presented on means to increase bypassing of the rumen to prevent nitrogen wastage when ruminants are fed concentrate diets. Contributions of ruminal microbes in utilizing cellulosic materials as lignocellulose and hemicellulose as well as starch and other carbohydrates are discussed. University of Florida, Gainesville, Florida, U.S.A. and California State Polytechnic University, Pomona, California, U.S.A.